Bright chrome finish and a 900kg bay capacity. 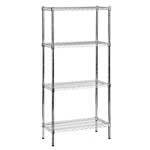 Wire shelving is easy to assemble, practical and has a wide range of uses from offices to storerooms. These units are just as at home out in the open, where their stylish design will compliment the decor of modern offices, or hidden away in cupboards where they act as a easy to use storage solution. 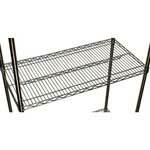 The big advantage of a wire shelving unit is the fact that it is made from coated steel wire bent into the desired shape, this means that the shelves are of a mesh construction, meaning air can freely circulate around stock or any spills will pass freely through the shelf, this is often important for food storage. Whilst not a heavy duty shelving, the load capacity of the shelving rack is often more than adequate to cope with the majority of demands placed on it within an office or kitchen setting. 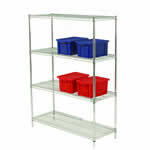 If you require shelving with a larger weight capacity, we would recommend looking at stockroom shelving instead. 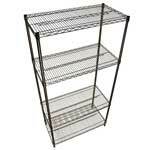 Traditionally this product is known as chrome wire shelving, as the steel is coated in a chrome finish, but we also supply products that are finished in black, with an anodised coating. The standard chrome shelving unit is a great way to add extra storage space to corners of a kitchen, storerooms of even within a home office or studio. 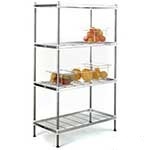 The stylish nature of the shelf units mean that is can happily be out in the open where staff and visitors will see it. 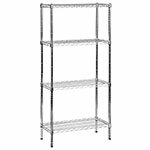 Our wire shelving is freestanding, meaning it can be re positioned as required and can also be used in the centre of rooms so that both sides can be accessed for storage. Whilst not suitable a a wall mounted solution, these shelf units are often positioned against a wall to increase stability and maximise floor space. Both the chrome finished wire units and the black ones are very simple to assemble; with just the use of a soft rubber mallet they can be lightly tapped together in no time without the aid of any extra tools. This flexibility means that assemble is quick, easy and often can be done with just one person. 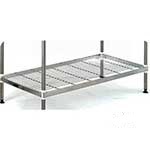 These Shelving systems will normally come with 4 shelves, but the method of their assembly means that there is a large amount of flexibility in the heights that the shelves can be positioned at, again, the boltless design means that shelf heights can be altered easily, bringing an extra level of adaptability to these units. 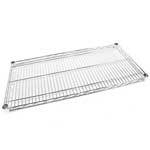 If you require these to be used in the storage of food, we recommend looking at the stainless steel wire shelving. Not only does this have a very respectable 300kg shelf capacity, it also is hygienic thanks to its construction from 304 grade stainless steel. All these units come in two types; start bays or extension bays. 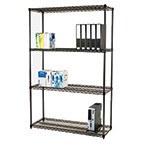 If you intend to just have a single unit, then you need a starter bay, however, if you would like to extend the storage area by joining ion a second set of shelves, you will then need an extension bay. Extension bays cannot be used on their own as they have only two uprights. 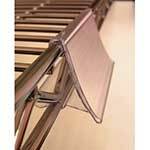 Even though the open design of these wire shelves makes seeing the stored content easy, you may also like to add clip on label holders to the front of the shelf. Theses clips hold paper labels that identify the shelf contents, this is useful if there the contents are boxed and not easily viewed or if similar items are stores side by side that need to distinguished.